Have you read Matt Paprocki's review on Variety.com of Ubisoft's Tom Clancy's The Division 2? Well, it's quite... interesting. You won't learn much about The Division 2 (rather unfortunate, since it's the first The Division 2 review I've actually read), but you will learn about how frustrated Mr. Paprocki is about Fox News host Tucker Carlson being on TV and defending conservative values and gun rights. It's a kooky review, but Variety is culturally important (I didn't know they wrote about games—though games are part of the culture, so it makes sense) in the United States. And, importantly for the videogame industry, they have a seat as a Metacritic-approved reviewer. The scores are positive for almost everyone... and Variety is the only negative one. For a game about division, that's pretty good. That means it's worth giving some attention to this review, since it affects the industry. You can find a near infinite number of reviews that treat games as products and break them down into a general format. Variety's approach is to treat them as pieces of culture, and with that, what games reflect. Mr. Paprocki also expands on his reviewing philosophy in his résumé as “offering insight into the medium's social growth and artistic merit.” Essentially, Variety and Paprocki give variety to the game-reviewing part of the industry by focusing on the kinds of critical cultural aspects that other game reviewers don't do. I do believe that has its place. I mean, of course I should say that. KoopaTV, this very website, does that all of the time. I just did that as recently as this week, taking the gameplay mechanics of character-to-character socialisation and comparing them to real-life college students’ networking habits. However, we don't go and call those reviews. We have other article categories for that. The cultural and political things we leave for the rest of the site. Not that we're on Metacritic anyway, but that's the best thing to do when you consider the responsibility that a writer wields when using their authoritative voice to influence discussion and sales. It's not very good writing, either. Matt Paprocki goes way too much into his clear dislike of Tucker Carlson, but doesn't even back up his anti-Tucker blatherings with evidence. It's not the most apt comparison to a conservative talking head he could make. Tucker Carlson's pet issue isn't even guns! Paprocki characterises the feedback loop of looter shooters—cycling through more powerful weaponry as you progress through the game while fighting more powerful enemies, which is a feedback loop in games dating back many decades and even millennia for literature—as a result of a recent American Second Amendment-related concept. That doesn't make sense. It's clear that the reviewer isn't a fan of the loop and finds the whole thing pointless—and it's the fault of the game for not making it interesting (though I don't think he played the game in good faith)—but it's dumb to judge it based on his personal political preferences than in gameplay terms. Game reviews should be different than other mediums’ reviews, because games are fundamentally different than other mediums. While I like Tucker's show, that doesn't affect my opinion that this review was a disaster. (If he bashed Rachel Maddow, I'd have the same opinion.) It could've been written for really any shooting game, and isn't specific to The Division 2, leading many to wonder in the comments section what Paprocki was doing during the 15 hours he alleged to have played the game. Perhaps he just needed to vent against the right-wing boogeyman of Tucker Carlson that day. He didn't review The Division 2 as a cultural artifact. He just projected his half-baked hateful thoughts swirling in his inner monologue. And I review his review as a poor review. Ludwig believes that readers have stopped putting trust in what the critics have to say. At least when IGN got their Fire Emblem: Radiant Dawn review totally wrong, they still talked in gaming terms. 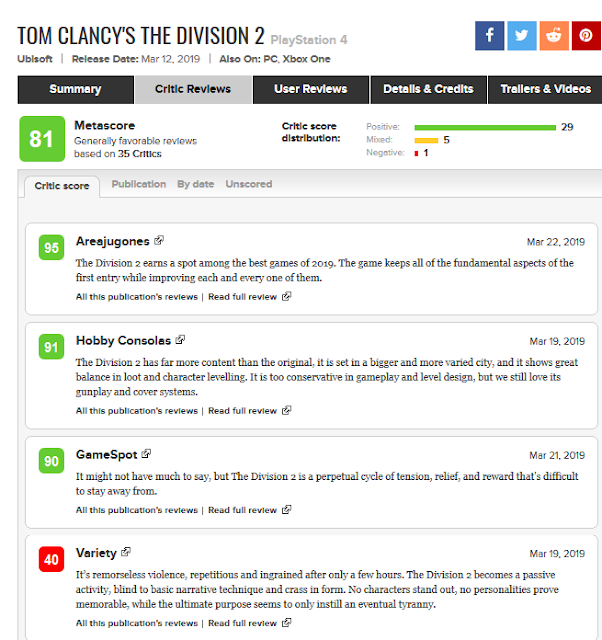 At least The Division 2 is more well-received than the first The Division.